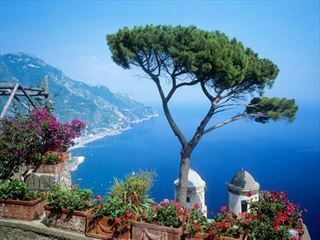 Take a leisurely 10-day escorted tour, with five nights in one base to enjoy the Amalfi Coast and surrounding area. 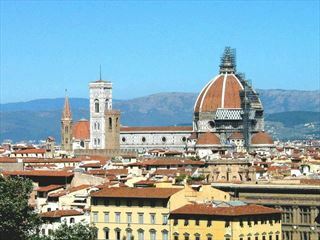 Starting with two nights in Rome, you will be taken on a guided tour of the classical sights of this most historic city. When on the Amalfi Coast, you will enjoy spectacular coastal vistas, charming seaside resorts and time to indulge in the local food and drink. 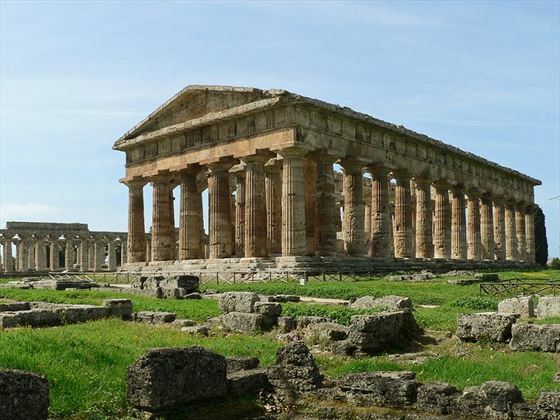 Visits to the impressive Greek temples of Paestum and the preserved ruins of Pompeii, will allow you to immerse yourself in the history of this fascinating country. This evening begin your tour by joining your fellow travellers at a popular local restaurant for a special welcome dinner featuring delicious regional dishes and delightful local wines. 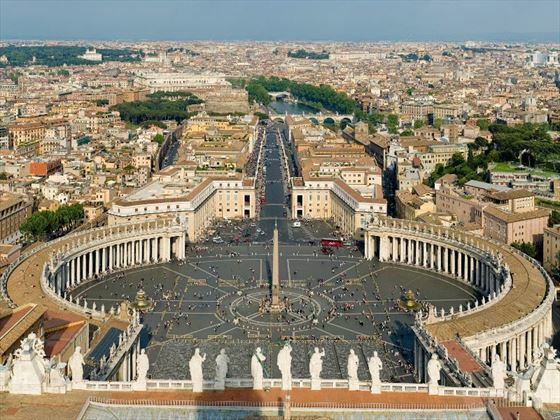 This morning you can choose to take an optional tour of the Vatican City, taking in the magnificent Vatican Museum and St Peter’s Basilica. 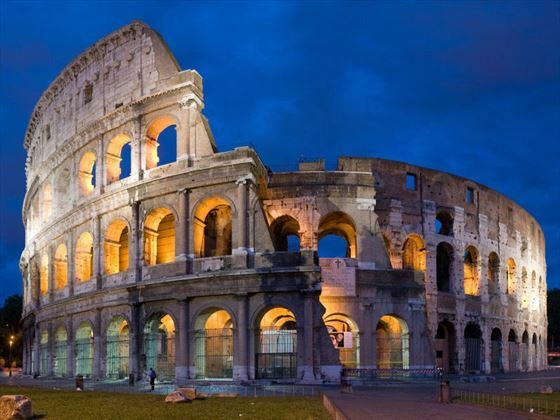 Later we will all set out on a classical tour of Rome, featuring the impressive Piazza Venezia, the Roman Forum, the Arch of Constantine and Circus Maximus – the Roman chariot racing stadium. This is followed by an in-depth tour with a local expert of the spectacular Coliseum, the largest amphitheatre of the Roman Empire. Leave Rome and travel southwards to the Amalfi Coast to the gorgeous resort of Ravello. Here visit the magnificent Giardini di Villa Rufulo, where you will admire the exquisite gardens and stunning views. 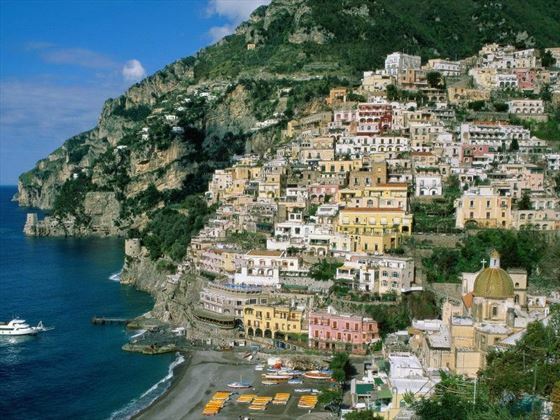 Continue to your hotel on the Amalfi Coast which will be your home for the next five nights. Begin the day with a stroll around the charming seaside resort of Sorrento, enjoy browsing the shops and relax over a coffee in one of the pretty cafes. Then take a scenic drive to Amalfi, a charming town which you will be able to explore the winding streets and stroll along the seafront promenade. Next take a short drive up the coast to Minori where you will have the opportunity to sample the local speciality drink at a family-owned limoncello production house. You will also have an afternoon break to enjoy some pastries and treats at a local café, followed by an evening at leisure. This morning enjoy a fascinating tour of a local buffalo milk mozzarella factory. Continue onto the ancient site of Paestrum. Here a local guide will take you through some of the best-preserved Greek temples in the world. Founded by Greek colonists in 600 BC, the city was abandoned for centuries and excavated in the 18th century, and you can now view this impressive site. This evening enjoy dinner in a popular local restaurant. Enjoy a day at leisure to enjoy this beautiful coast. 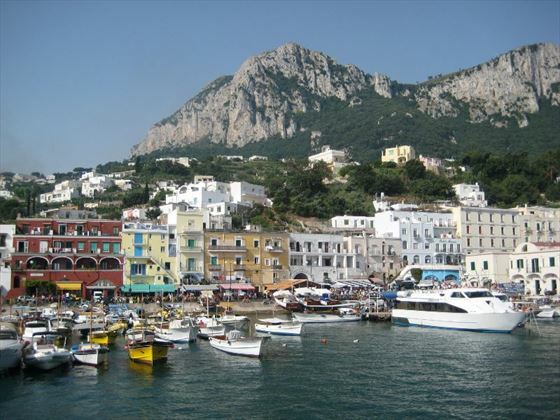 You may want to take an optional boat trip to the dramatic island of Capri in the Bay of Naples, where a local guide will take you around this island paradise. 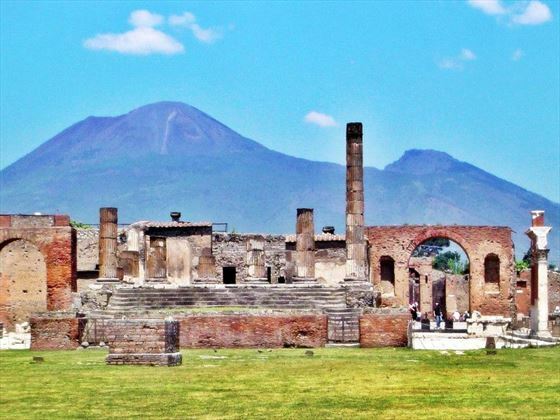 Today you will immerse yourself in history, visiting the excavated ruins of Pompeii. Guided by a local expert you will the preserved buildings of a typical Roman town from 2,000 years ago – with villas, streets and even the casts of people and animals frozen in time after being buried in 20 feet of ash and pumice from the eruption of Vesuvius in 79 AD. Then you will stop at a local winery at the foot of Mount Vesuvius to enjoy a typical Neapolitan lunch and sample the local wines. Wave a fond farewell to the Amalfi Coast and travel to vibrant Naples, where you will enjoy a visit to the National Archaeological Museum. This impressive museum houses many of the best mosaics and frescoes from Pompeii and a world-class collection of sculpture including the Farnese Hercules. Continue on to Rome, where you will enjoy your final evening at a farewell dinner toasting the end of a fabulous Italian experience. 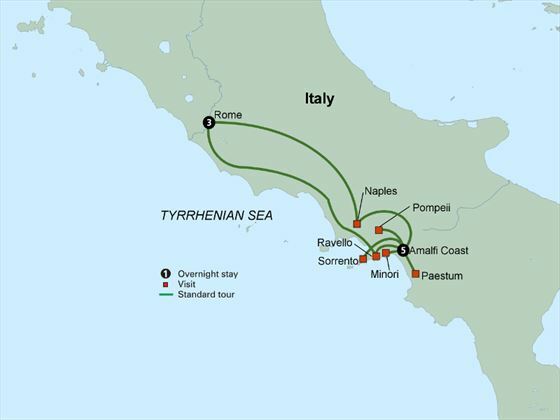 Discover the sights of Southern Italy and the island of Sicily on a 12-day escorted tour. Highlights include the fascinating site of Pompeii, the Matera cave dwellings, the Pulia trulli houses, and the beautiful coastal regions of Sorrento and Amalfi. 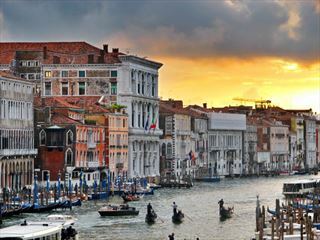 A 10-day escorted tour through the wonderful sights, sounds and tastes of Italy. 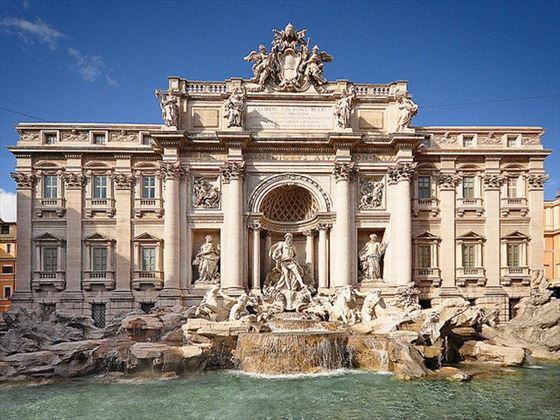 Begin in Rome with its history spanning two and a half thousand years. Travel through beautiful Tuscany to Florence, then continue to the picture-perfect city of Venice, and finally vibrant Milan. A relaxed tour of beautiful, historic Italy, with two night stays in Rome, Sorrento, Florence, Venice and the Lakes region, with an option to continue the tour to Milan. Enjoy lunch in a Tuscan winery and several dinners featuring regional specialties.